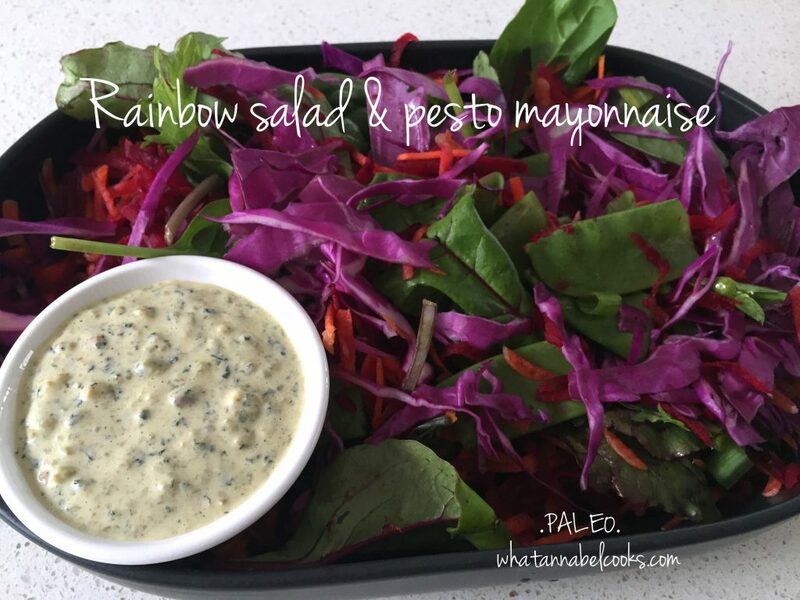 I don’t use purple cabbage all that much but when I added it to this salad, it just looked so gorgeous! I don’t know about you but I get into a rut with salads. After a while they are all very similar. That’s why this one is fun as it’s added another colour and with the grated beetroot and carrot there are a few textures too. You could just as easily serve it with a balsamic/lemon/olive oil style dressing. A few nuts or seeds sprinkled on top would be nice too. Adjust quantities according to the number you want to feed. This one serves 3-4. To make pesto mayonnaise, mixed equal proportions of pesto with mayonnaise and either serve on the side or toss the salad in the dressing for a more coleslaw style salad. Place all ingredients in food processor and blitz until finely chopped and a chunky paste is formed. You will probably want to taste and adjust flavours eg more lemon/salt and adjust for consistency with oil and even a bit of water if you want it a bit thinner. In a food processor or stick blender blitz the garlic, lemon juice, mustard, egg, s&p, anchovies and about 1/4 cup of the oil. Blitz until well combined. Then with the processor/stick blender going SLOWLY pour in the rest of the oil in a constant but gentle trickle. Keep going until the oil isn’t absorbed anymore – if it won’t ‘blend’ in anymore, just stop adding the oil. Taste and season again if needed. Refrigerate.